Why Book Your Tours With Us? Why pay the same and be one of 10 – 20 tourists when you can have a personal experience in your own 4×4 rather than a sweaty bus or bumpy jeep for the same price? Do you get champagne and little treats on the way with other guided tours as part of the package? Do you actually get to experience the real Gambia when you are part of a well-rehearsed package tour? Why take risks with local tour guides who may not be insured and may not have your best interests at heart? Why not use Neneh, one of only two qualified female tour guides in The Gambia to make sure that you are safe and looked after in an air conditioned 4×4 and you are the only two on the tour – we don’t do mass produced! Meet Neneh our Tour Guide. Neneh is one of only two qualified female Gambian guides in The Gambia and she is working with Picca Laa to provide a female friendly guide service – a brave move in a male dominated business. This means that women travelling alone or with friends can have all the benefits of a knowledgeable guide with the security of that female touch. Collect from hotel 10.00h in 4×4. Local female guide Neneh will look after you. Why not extend the experience to an overnight stay at Picca Laa a local Eco Lodge in Tanji village with electricity and riverside location – experience the sounds of Africa for an extra £25 per head including evening meal and breakfast by the river. • Pick up from hotel 06.30 in 4×4 by local female guide Neneh. • Watch the birds by the river. Over 80 species have been recorded here in a 2-week period so bring your binoculars! • Escorted bird safari to Tanji Bird Reserve just along the road – see how many you can spot – alternatively just enjoy the nature at Picca Laa and relax! • Why not extend the experience to an overnight stay at Picca Laa a local Eco Lodge in Tanji village with electricity and riverside location – experience the sounds of Africa for an extra £30 per head including lunch, evening meal and breakfast by the river before returning to your hotel? • Pick up from hotel 10.00 in 4×4 by local female guide Neneh. Why not extend the experience to an overnight stay at Picca Laa a local Eco Lodge in Tanji village with electricity and riverside location – experience the sounds of Africa for an extra £25 per head including evening meal and breakfast by the river? • Visit (what is the bar Helen took us to down that steep road)? • Transfer by 4×4 to Sanyang a little way down the coast. This will be our lunch stop on us off with prosecco included. • If time permits then a visit to a real local beach bar by Tanji and right on the beach – a well-kept secret! Relax by the beach and enjoy a beer or soft drink. More energetic – fantastic bay for those who have the energy for a jog. Get some sand in your trainers on a nice beach run. 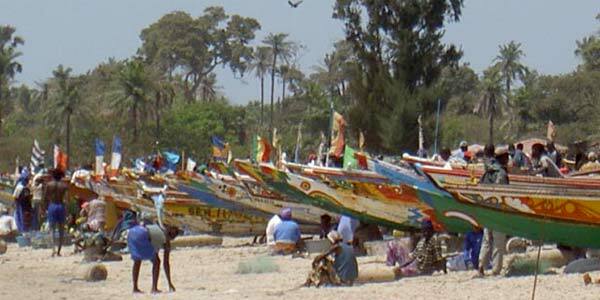 Why not take a short Safari and see more of The Gambia? Excursions with local guides can be arranged from 1-3 days exploring local villages or up country to visit Basse, Georgetown or even neighbouring Senegal. Local transport can be arranged either 4×4 or minibus depending on the trip and size of party. 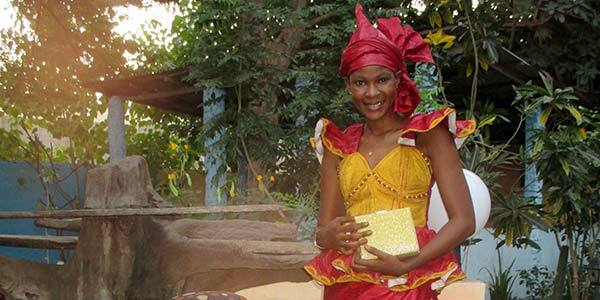 Want to find out more about life in The Gambia? 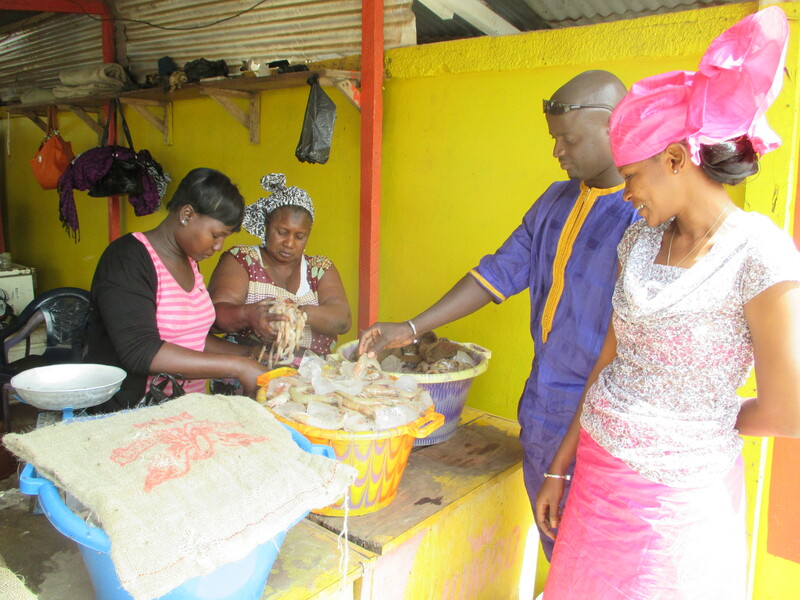 What about a chance to visit the bustling Serrakunda market where you can buy local ingredients used to make the flavoursome local specialities like Benechin, Domada or Yassa? Why not take an accompanied trip, buy the local ingredients and learn to prepare the local foods with the help of the local villagers. Visit a local compound and share green tea while the food cooks over a charcoal fire? Watch the News page for some local recipes to tempt your palette! Like to Walk on the Wild Side and enjoy the birds and wildlife of The Gambia? Guided walks and mini tours can be arranged with the best local guides which means that you will have the chance to see some of the more unusual birds in a selection of settings. 1-3 day Bird Safaris can be organised for you and your party.